• I'm getting really excited for the upcoming Spring/Summer 2014 fashion week which happens the second week of September in NYC. Brave GentleMan's SS2014 collection is pretty awesome, made in NYC with sustainable, organic and vegan textiles, and I couldn't resist trying on one of my creations in sustainable domestic linen and snapping a pic for Instagram. Consider this a sneak peek! • This excerpt from the 2011 documentary, Samsara by Ron Fricke, has gone viral in the last few days. The sheer scale of the industrial animal agricultural system depicted is simply haunting. What may seem like a scene from a dystopic science fiction fantasy is all too real. It's happening right now. Joining us today is comedian, TV host, and “Jackass” star, Steve-O, who will tell us why he’s a passionate vegan, let us in on what items he had to jump through hoops for to get leather-free, and, shockingly, he’ll apologize for some previous behavior involving animal exploitation. 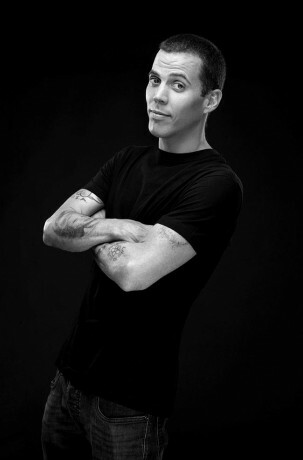 Learn why your angry comments to Steve-O changed him forever. Play the Podcast in a new window. Download the podcast here.